The Crimson gives a quick primer on the final clubs, institutions unique to Harvard, and the administration’s actions toward them over this tumultuous year. In a few years, Harvard undergraduate members of unrecognized single-gender social organizations will no longer be eligible to hold leadership positions in official student organizations and athletic team captaincies. They will also be ineligible for the College’s endorsement for prestigious fellowships like the Rhodes and the Marshall. The new sanctions are almost sure to have sweeping effects on Harvard’s final clubs, fraternities, and sororities. The announcements marks the first time Dean of the College Rakesh Khurana has publicly detailed how the College plans to regulate unrecognized single gender social organizations. Below is a quick primer on the final clubs, institutions unique to Harvard, and the administration’s actions toward them over this tumultuous year. Final clubs are historically single-gender social clubs. Although similar to fraternities and sororities, clubs are differentiated by their unique selection process. Students may not join until their sophomore year and even then must be “punched,” or invited to apply, for membership. Over successive rounds of punch events, the number of “punches” is winnowed down until a select few are initiated into the club. Also unlike fraternities and sororities, clubs are independently owned and, since 1984, are unaffiliated with the University—a decision they made after administrators tried to force them to go co-ed. Most clubs are Massachusetts corporations ultimately run by club graduates, who control the club’s assets and finances. Harvard has six all-male clubs, five all-female clubs, and two co-ed clubs—though within one of those, the Fox Club, women enjoy only “provisional” membership after internal divisions over whether to admit women racked the club’s graduate leadership. The eight historically male clubs own valuable Cambridge properties and have included in their membership several United States Presidents, well-known authors, and politicians. The female clubs are much younger, with the first one forming in 1991, and have yet to secure full control of off-campus properties. Why is the administration concerned about final clubs? The administration has levelled two main criticisms against the clubs: one centered around sexual assault and another focussing on gender equity and perceived elitism. The clubs were the subject of much criticism in a University-wide report on sexual assault prevention released in March. The report stated that 47 percent of surveyed female College seniors “participating in the Final Clubs” had experienced “nonconsensual sexual contact” during their time in College. An independent analysis commissioned by the all-male Porcellian Club, however, contested the relevance of that figure. In an interview this week, Faust stood by the report, saying that qualitative and quantitative data backed the findings. As early as 2011, now-Dean of the College Rakesh Khurana criticized the clubs, saying that he was “always suspicious of a club that builds itself on gendered exclusivity.” Since assuming the deanship in 2014, he has reiterated that, in his mind, single-gendered social organizations “are not appropriate” for the College. How have the men's clubs responded to pressures to go gender neutral? This spring, leaders of the Porcellian Club and the Fly club have publicly criticized the administration for the way Harvard has pressured the clubs to reform. Then-graduate president of the Porcellian Charles M. Storey ’82 implied that the Porcellian was “being used as a scapegoat for the sexual assault problem at Harvard.” Fly Club president Richard T. Porteus Jr. ’78 publicly called for Khurana’s recusal from conversations with clubs, citing a recent Title IX lawsuit as evidence of a “conflict of interest” on Khurana’s part. What about the female final clubs? 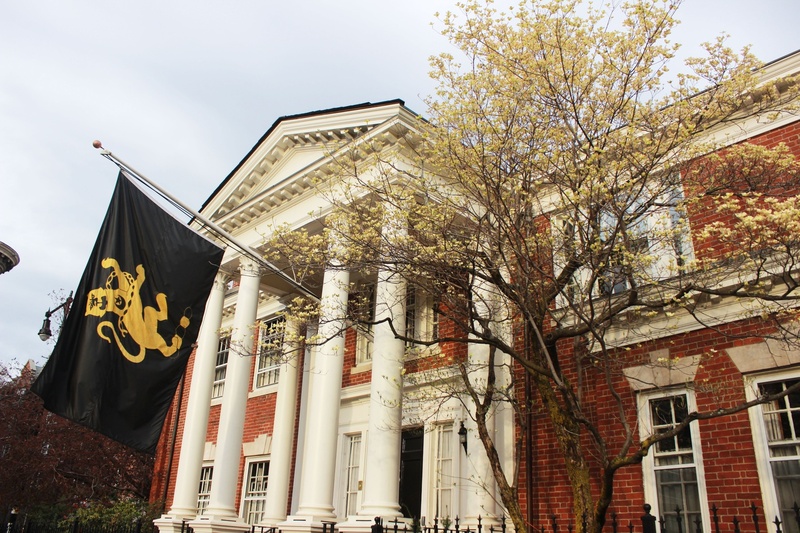 The all-female clubs have expressed fewer of their concerns publicly, though a recent op-ed in The Crimson from the graduate leaders of the Sablière society accused administrators of ignoring the concerns of the all-female clubs and pursuing gender neutral membership “primarily as a form of damage control” after negative media attention. Though the op-ed expressed agreement with the goal of “moving towards gender inclusivity,” its authors implied that because the female clubs do not have regular access to property, they could die out if they were forced to compete with propertied clubs for new recruits. What options were on the table? Khurana and other administrators repeatedly kept their options open and their thoughts private, refusing to rule out regulations as strong as prohibiting simultaneous enrollment in the College and membership in a club. For months, clubs have feared that the College could consider barring undergraduates from joining single gender social organizations, a policy Amherst instituted in 2014. The policy that Khurana ultimately announced was proposed at a meeting with graduate and undergraduate final club leaders in April. What does the new policy do? Starting with the Class of 2021, members of unrecognized single-gender social organizations will not be allowed to hold leadership positions in recognized student organizations and will be ineligible to apply for fellowships (such as the Rhodes and Marshall) that require endorsement from the Dean of the College. This will include not only members of final clubs, but also students associated with fraternities, sororities, or any other single-gender unrecognized group, such as the all-male Oak Club. How will the College enforce it? A yet-to-be-appointed committee of students, faculty and administrators will decide the specifics of enforcement. Given many unrecognized single-gender clubs do not publicize their membership lists, enforcement could present a logistical headache for the administration. While Faust wrote in her announcement that students can “decide for themselves” whether to join single-gender social organizations, neither she nor Khurana ruled out an outright ban on membership for Harvard students. Faust asked Khurana to provide a report at the end of each of the next three academic years exploring “whether the College should be considering any further action” towards the clubs.